Parkinson support groups enable people who are facing similar challenges to share experiences, and resources in a supportive environment. The goal is to help participants deal positively with this life-changing condition. Parkinson support groups are led by a professional facilitator and light refreshments are available. Support group meetings are offered free of charge, but registration is required. Every year, thousands of Quebecers experience the break-up of their families and a growing number are experiencing co-parenting living. Separations, remarriage, forming new partnerships and divorce are impacting the lives of parents and their children on a daily basis. Consequentially for some families, a variety of struggles can occur. The task of re-building lives while maintaining family relations in the midst of change often requires outside intervention and services which are either inadequate or not readily available. 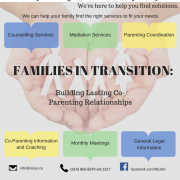 REISA is committed to supporting these families and will be providing monthly information sessions aimed at creating a space to help families navigate the separation process. Meetings will be held at the Leonardo Da Vinci Centre and will be led by Dominic D’Abate of Consensus Mediation Center with the presence of a lawyer. Please consult our calendar of events for the dates of our monthly meetings. 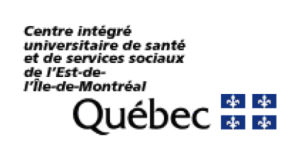 The CIUSSS de-l’est-de-l’île-de-Montréal now has mobile intervention services in the east end! 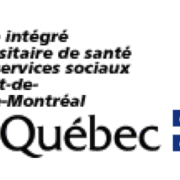 This service called, Équipe mobile Résolution, regroups different health professionals such as social workers, nurses and psychoeducators to help people and their loved ones in psychological distress. Their services, including house calls, are available everyday from 7 am – 11 pm, along with a 24h telephone helpline. You can contact the Équipe mobile Résolution at 514-351-9592. Through funding and support from the CHSSN, REISA has produced a Health Passport for Montreal East. 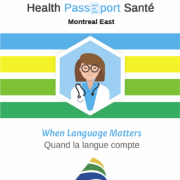 The goal of this guide is to make it easier for an English-speaking person to communicate with French-speaking health professionals. The health passport web application has been designed to help you and your family keep track of essential health information and puts helpful words and phrases at your fingertips. One year in action – a brief summary of highlights from REISA’s 2015-2016 year. Don’t miss REISA’s Annual General Meeting, to be held on June 30, 2016! After 3 years in the making, REISA is pleased to announce that the Centre for Dreams and Hopes opened its doors to the community for the grand opening of their Snoezelen Room. Snoezelen Multi-Sensory Environments offer a relaxed atmosphere with pleasant surroundings, soothing sounds, captivating aromas, tactile experiences, massage and vibration, vibrosonic sensations, and gentle movement. Snoezelen rooms provide the tools and a suitable, gradable, and safe environment in which professionals can carry out assessments and interventions. The Snoezelen Room Grand Opening was held on Tuesday, March 22, and was a great success with a lot of community support. REISA is very pleased to present to you some great news! 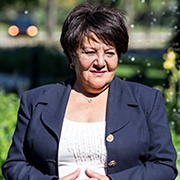 REISA’s Executive Director, Ms. Fatiha Gatre Guemiri, is among three recipients of the Quebec Community Groups Network’s seventh annual Sheila and Victor Goldbloom Distinguished Community Service Award! For more information, visit http://qcgn.ca/goldbloom-awards-2015/. 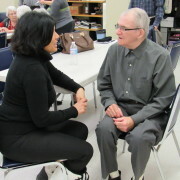 In April 2015, a focus group was held at the Almage Seniors Center where the English-speaking seniors voiced the need to gain a better knowledge of the services offered by their local CLSC, and the need to have a better understanding of the complaint system. On February 23, REISA organized a presentation given by Carolyn Mrazik and Nina Echegoyen, respectively social worker and nurse in home support services from the CLSC Mercier-Est-Anjou. Both presenters demystified the trajectory of a request for services at the CLSC from the initial contact up to the delivery of the specific services and presented the process of lodging a formal complaint as in most cases, the seniors were not aware of how to do this. They also encouraged the seniors to exercise their right to get adequate services in English. This presentation was a joint initiative from the partnership between REISA, Almage and the Mercier-Est-Anjou CLSC under the Liaison pilot project. 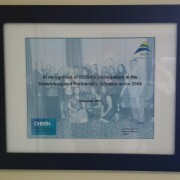 On December 15, the Community Health and Social Services Network (CHSSN), one of our longtime partners, thoughtfully awarded REISA with a certificate of recognition for participation in the Networking and Partnership Initiative. Looking for a family doctor in Montreal? Are you looking for a family doctor? To find a family doctor who is accepting new patients, you can be added to the waiting list. Your request will be evaluated and priority will be granted according to your health. You may also find a family doctor yourself by contacting medical clinics or family medicine groups (GMFs) near you to see if they are accepting new patients. https://www.reisa.ca/wp-content/uploads/2016/03/Reisa-Logo.jpg 355 421 REISA https://www.reisa.ca/wp-content/uploads/2016/03/Reisa-Logo-Favicon.png REISA2016-01-02 02:11:012016-06-28 02:20:47Looking for a family doctor in Montreal?